Multiplatinum hip-hop artist and criminal justice reform advocate Meek Mill returns to the road with his U.S. tour titled “The Motivation Tour” with special guests Lil Durk, Kash Doll, and Melii. The Philadelphia rapper released his latest album CHAMPIONSHIPS November 2018. 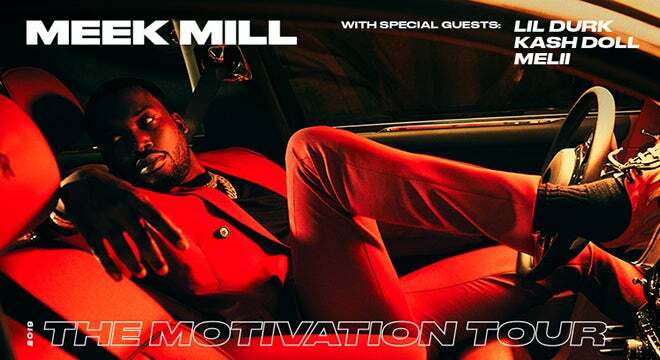 Produced by Live Nation, the 16-city U.S. tour will stop at the Fox Theatre on Saturday, March 9 at 8 p.m.
Meek Mill is a critically-acclaimed multiplatinum hip-hop artist, songwriter and entrepreneur that hails from Philadelphia, Pennsylvania. Meek Mill evolved from Philadelphia’s hottest underground rapper to one of the world’s preeminent musical artists, having released a slew of smash studio albums and singles, including “Ima Boss,” “Dreams and Nightmares (Intro),” “All Eyes on You” and “Whatever You Need,” among many others. In October 2012, Mill announced the launch of his own label imprint, Dream Chasers, named after his mixtape series. In addition to serving as the CEO of Dream Chasers, Mill is also an advocate for criminal justice reform in the United States with a focus on creating stronger prison rehabilitation programs, improving the bail system, shortening probationary periods.